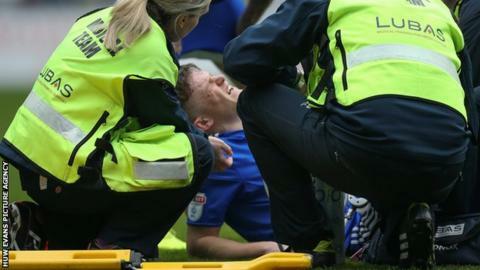 Cardiff City striker Rhys Healey will be out for nine months after surgery for torn anterior cruciate and medial collateral ligaments. Healey suffered the injury during Saturday's 5-0 thrashing of Rotherham in the Championship. The 22-year-old fell unchallenged and left the field on a stretcher during the first half. "It soured everything really," Cardiff manager Neil Warnock said after the win. "He's done so well for us, given us a new lease of life - his winner against Burton and getting the penalty against Derby the other night. "To miss out on a nothing injury - I think his studs caught in the turf and it's a crying shame for the young lad." The game against Rotherham was Healey's first home league start for Cardiff, who he joined from Welsh Premier League side Connah's Quay in 2013. He has had loan spells at Colchester, Dundee and Newport County but forced himself into first-team reckoning for the Bluebirds with some impressive displays as a substitute. Healey's injury was the one bleak note for Cardiff on Saturday as they recorded their biggest win since beating Bristol City 6-0 in 2010. The Bluebirds' third successive victory keeps them 12th in the Championship table - a far cry from the dire situation when Warnock took charge in October with the club second from bottom. The Millers, on the other hand, are firmly rooted to the foot of the table and are 15 points adrift of safety. Warnock saved Rotherham United from relegation last season but, with the Yorkshire club now seemingly destined for the drop, the 68-year-old is saddened by his former side's decline. "We didn't really give them a look-in in the second half. It's difficult for Rotherham," said Warnock. "They're decimated by injury, they've got the two lads from us [on loan - Semi Ajayi and Tom Adeyemi], who can't play, they've got a few more problems and I've been there. "I know how difficult it is. While it's a great win, I don't take any satisfaction at all from seeing the position they're in."